An immigration detention centre is "unsafe" for the families held there, according to the prisons watchdog. Harmondsworth Immigration Removal Centre near Heathrow Airport in west London was found to have increasing levels of disorder. A report by the Chief Inspector of Prisons found there were seven assaults a week at the 550-bed centre and some failed asylum seekers had resorted to starting fires. The centre, which opened two years ago, was originally expected to process 3,000 people a year who were due to be deported, but is actually handling 12,000, the report said. Harmondsworth holds people detained by the Immigration Service as overstayers, illegal entrants or failed asylum seekers prior to their removal from the country. It also holds a smaller number of detainees whose cases have not yet been determined but who are thought to be at risk of absconding or whose identities have not been established. Chief Inspector of Prisons Anne Owers, making her first full inspection since the centre opened in September 2001, found there were reports of families, and a pregnant woman, held for hours in vans waiting for admission. She heard of injuries to detainees during failed attempts to remove them and criticised procedures to prevent suicides. The report said the environment in the centre was unsafe partly because of actions by a small group waiting to be sent home who had resorted to arson and causing damage. Ms Owers said: "This was clearly a frightening and potentially dangerous situation for other detainees and though staff responded swiftly and competently to individual incidents, the centre as a whole was not well-equipped to ensure detainees' protection." She said there was no means of securing the centre in the event of a riot and there had been no health and safety assessment of the risks to detainees. Like other removal centres, Harmondsworth was criticised for not having sufficiently competent legal advice and representation for detainees or independent welfare advice. 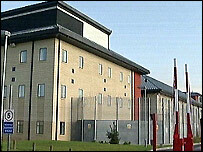 Home Office minister Beverley Hughes said all allegations of injuries to detainees were investigated. "I realise that in some cases restraint has to be used to control uncooperative and sometimes violent individuals, but mistreatment of detainees by any member of staff is not acceptable," she said. She said there were 839 escorted removals and 11 formal complaints in the period referred to in the report. Nine of those were referred to the police for investigation and in all 11 cases the complaints were found to be "unsubstantiated", said Ms Owers. Maeve Sherlock of the Refugee Council said the government should reassess its approach to detention in the light of the report. "Detaining people who have committed no crime and who are merely waiting for a decision on their asylum claim is simply wrong. "It is of particular concern to us that children are not getting the protection and support that they need." Shadow Home Secretary Oliver Letwin said the report showed that large immigration centres were not likely to work. "There were reports of families and a pregnant woman held in a van for hours"